The phrase "Based on the Nickelodeon Series!" is usually enough to put me directly to sleep. It's like an extra-strength sleep aid. But then you throw "From Platinum Games" on the end, and we're talking about something else completely. I went from bored to very interested earlier this year when The Legend of Korra game was announced as a project by Platinum Games, the team behind insane action games like Bayonetta, Vanquish and Metal Gear Rising. 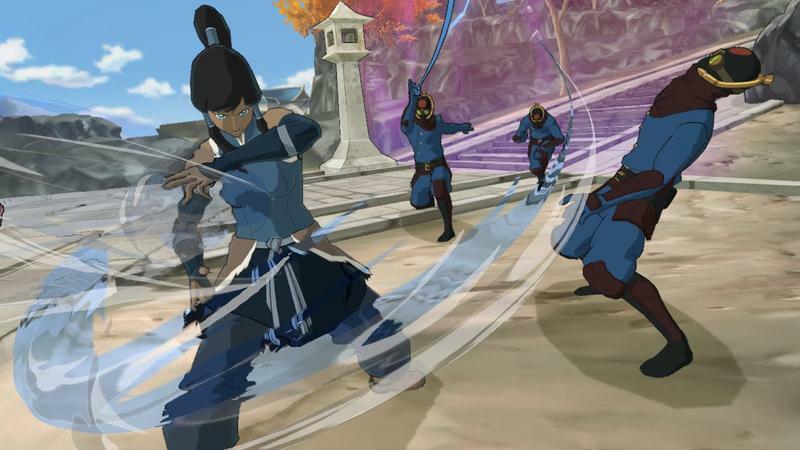 This weekend during San Diego Comic-Con, the first extended gameplay footage of The Legend of Korra was unveiled. While the footage is clearly not from a finished game, the fast, two-button action and slow-motion close combat sequences are immediately noticeable as marks of a game from Platinum. The fifteen minute clip drags at times as the person playing spends a bit more time than necessary tearing up the environment, but we get to see some great combat, a boss battle, and an on-rails sequence featuring Korra's polar bear dog thing, Naga. According to an interview with IGN, the game starts with Korra's powers being blocked, which she'll unlock as she progresses through the story. The story lasts about four hours and then starts over with all the powers unlocked. Finally, in true Platinum fashion, there's an extra difficult mode after that. Yeah, four hours is pretty short, but this is a downloadable title. If it has the replayability of other Platinum games and a price to match, that might be just the right amount of game. Look for The Legend of Korra this fall on PC, PlayStation 3, PlayStation 4, Xbox 360 and Xbox One.